I’m wrapping up my RAship at the Simpson Center and have been going over my files for teacher development seminars that the Center sponsored this past year. One session in particular had an interesting syllabus and reading material that ties well with the social media aspect of our class. Crispin Thurlow is a professor in the Communications School who conducts research on youth and social technology. Check out his article “Fabricating youth: New-media discourse and the technologization of young people” in Youth, Identity, and Digital Media (MIT Press, 2008) as supplemental reading for our social tech coursebooks. Crispin applies a scholarly analysis to constructions of youth (and therefore adulthood) through perceptions of social technology. Another good article by Thurlow is “Wired whizzes or techno slaves? Young people and their emergent communication technologies” which covers the range of social technologies discussed in Born Digital and talks about notions of risk. There is also a good article by Susan Herring called “Questioning the General Divide: Technological Exoticism and Adult Constructions of Online Youth Identity” that examines the contextual factors and social motivations shaping human behaviors, continuities, and technological trends. Like Thurlow, Herring also addresses the exoticizing of the internet generation through constructions of youth. Finally, my favorite reading from Thurlow’s syllabus is Danah Boyd’s article “Why Youth Heart Social Network Sites: The Role of Networked Publics in Teenage Social Life” – also from the MIT volume Youth, Identity, and Digital Media. Boyd’s article has a great theoretical discussion on the different meanings of public, types of publics (social networking sites), and some discussion on the implications of being socialized into a culture rooted in network publics. I came across two Seattle-based companies that have tools which invite participation. They are interesting platforms, which might be used for exhibits . . .
One is called co.collage, made by a company called Strands I found it in use at a store called Thrive (here is the link to their version of it) and you can visit their site where customers are encouraged to post photos and comments. These are shown in the store on a large screen in the format of a visual collage. It is very neighborhood focused and also seems to be a way of locals showing off events. The second is a company called Bee Docs which has created some timeline software. It seems like a really simple tool where people can load in events and photos and then they get put into a simple timeline that is ready to be shown in an exhibit or presentation. Nicole – I think they are using Strands (or something like it) in the coffeeshop Trabant, too. There are some free timeline tools like Simile Timeline and Ourstory.com, but they are definitely not as slick as the Bee Docs one. Thanks for sharing! Here Comes Everybody is a terrific primer on social media that encompasses a variety of case studies including Wikipedia, Digg, Twitter, Flickr, Facebook, Meetup, Myspace, Youtube, Blogger, and other technologies that have developed to help users organize, connect, and expand their communities through interacting in new ways around social objects. The author, Clay Shirky, uses a few examples that look at how users of social media have used those tools to challenge the establishment (digital campaign that led to policy changes in airline industry) and to disseminate information – i.e. cell phone photos of the London subway bombing in the aftermath of the event. 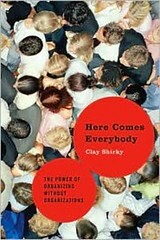 Reading Shirky’s book made me realize a couple of things. People use social technology in the way that makes sense to their own needs – mostly from what I can tell to typically network and expand their spheres of connection. I don’t think that there is any “wrong” (or right) way to use social technology, but I realize that I do not use these tools (nor do I have a true interest in using certain tools) to their fullest social capacity. I am a lazy lazy tagger, and have only recently gotten into the habit of labeling flickr photos and blog posts, now that I have an understanding of how user-generated content gets aggregated and organized on the world wide web. The readings for our social tech class have helped me get a stronger grasp of the whole web 2.0 thing, but I am also really interested in finding ways to be simultaneously less connected (in terms of time spent in the virtual world) and more effectively connected – this is perhaps informed by a desire to be more of the body, than the mind. At the Tricycle Magazine site, I recently came across a book called Wisdom 2.0 by Soren Gordhamer. Gordhamer consults on living with less stress and more effectiveness in technology-rich lives. Read an excerpt here. It might not be that you’re a lazy tagger. Remember that 80/20 rule. You probably haven’t found something that you’re so passionate about that you would be pat of the one or two percent that creates most of the content/participates on the highest level. I really liked the emphasis on making something big with love. I thought that was so applicable to museums, way more so than anything in groundswell. We can now take our small institutions that we care so deeply about and reach more people more efficiently with our mission/message. Clay Shirky talks a lot of sense. Amidst the panic of print meltdown he said what (some) dared not to say and what all should be saying. Let them die. Think the unthinkable. Create new modes of communication instead of resuscitating the old. Jason took the bull by the horns and asked today if we should create a hashtag for Twitter related to this course. For those folks who don’t use Twitter, it’s a short messaging service that allows you to broadcast out short messages (“tweets”) about your real-time thoughts, inspirations, etc. A hashtag is a mutually agreed upon label used to link lots of tweets about the same topic together. The advantage of the hashtag is that it can allow tweets by multiple people to be aggregated in one feed. Creative friends: ideas for a hashtag for a museum experiment in talking to strangers? Also, if you use Twitter, please share your username in the comments so we can all link up. I’m ninaksimon. “Muzeombies?” is what I heard whispered over my shoulder while I was reading this, but I’m not that into it. How about StrangeTalk, tweetNgreet, meetNtweet, Museobabble, or StrangeMuse. I think we may be followers, but i’m whitneyft and henryartgallery at work. I too am not so keen on Museozombie, Muzombies, or iterations thereof. I like the simplicity of talk2strangers. Or StrangeMuse. Maybe museNmix or mixNmuse or MuseumMix or MeetMuseMix? Or meetNmuse. You get the idea. Something smaller! @ and # should not take up half a tweet. What about: #strngr (looks like stronger!) or #oddtalk? I think #whoru might be mistaken for something else, but I do like #talk2m and #magicvest also. Went for #strangemuse by popular opinion. Just blogged about it here. strangemuse sounds good. for those of us unfamiliar with twitter, do we need to sign in and then search for strangemuse? I just read over the framework for the Zoo social experiment on Museum 2.0– thought provoking. I already have a few ideas. Though it also prompted me to wonder, is the first class meeting at the Zoo, and am I the only one who didn’t know? Apparently I will also have to aquaint my paleolithic cellular phone technology with Twitter, which so far I have only seen used for the power of evil: the incessant updating of facebook statuses and inane commentary on aggregate forums. I hope this new foray might provide evidence of the utility of ‘tweeting;’ right now I am dubious at best. And then Kelly answers her own question by realizing that the previously empty tabs on the course webpage actually now contain the syllabus. Sorry. Julie – to search for people using that tag, you would go to http://search.twitter.com and type #strangemuse into the search box. We’ll look at this on the 5th as well. And yes, we will be at the zoo on the 5th – I’ll send out an email tomorrow with more info about the plan.